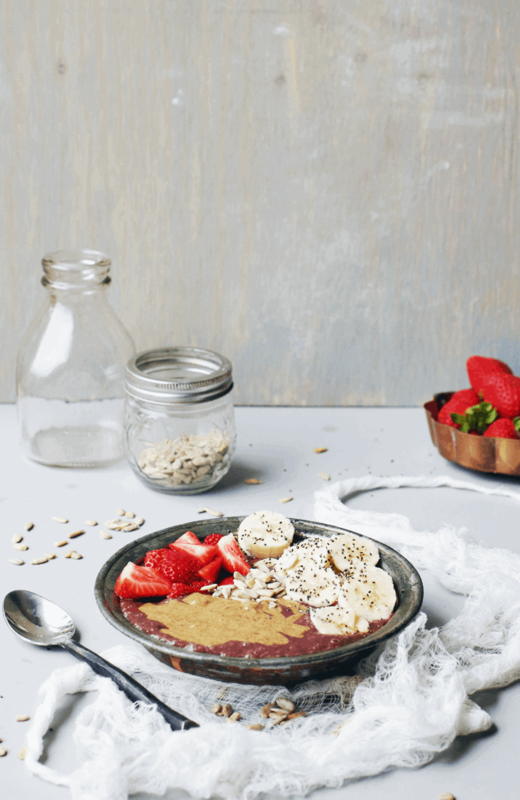 Take acai of relief knowing this almond butter acai bowl is full of nutrients and antioxidants. It’s the perfect healthy breakfast that fits all dietary restrictions, and it tastes like an amazing treat. You’re telling my this almond butter acai bowl is a healthy treat? Yep, that’s right. This bad bowl is vegan, gluten-free, dairy-free and, refined sugar-free. This is definitely one of those meals proving that healthy eating doesn’t equal nasty eating. (I’m looking at you, gluten-free bread that tastes like cardboard.) These vegan energy bites are also on my good list for healthy treats. I ate this for breakfast yesterday after a long run and it tasted better than ice cream, if you can even believe that! 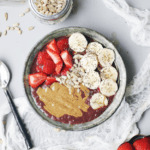 This almond butter acai bowl is great for recharging after a workout, because of all the antioxidants in this superfood meal. Did you know acai berries have shown increased mental function in preliminary studies? It is also suggested acai can help with weight loss, and maintaining a healthy weight. I know what I’m eating for the rest of my life! But where do I buy the acai? This is a question I get often! I buy the frozen Sambazon packets from Costco. However, I’ve learned that they are only carried in specific locations. In that case, you can buy them here. Feel free to mix up the fruits and toppings in your bowl. Not a fan of almond butter? Switch it out for peanut butter. You could also make a killer tropical acai bowl with pineapple, mango, and coconut. The options are endless! Whatever you do, make sure you do not skip out on the chia seeds. Along with taking my daily probiotics, it’s my secret for getting enough fiber to make sure my gut is healthy and regular. Adding some hemp heart seeds on top is another great way to pack in the protein, along with the almond butter. 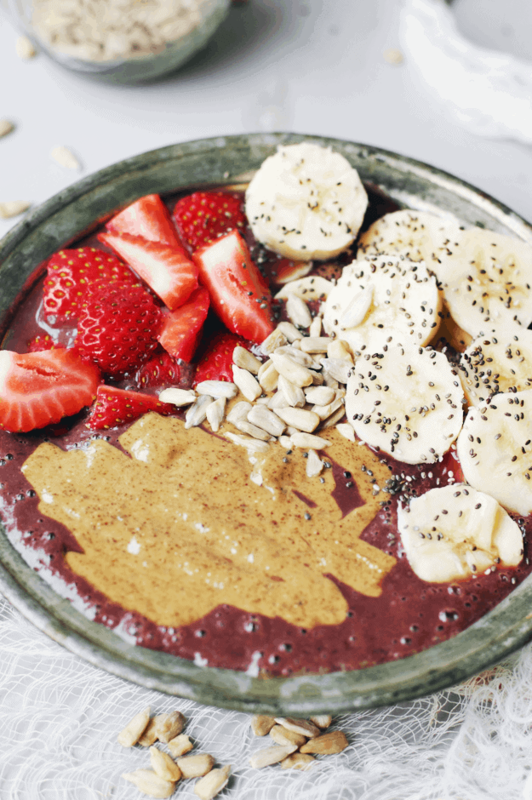 Basically, put ALL THE THINGS on this smoothie bowl! 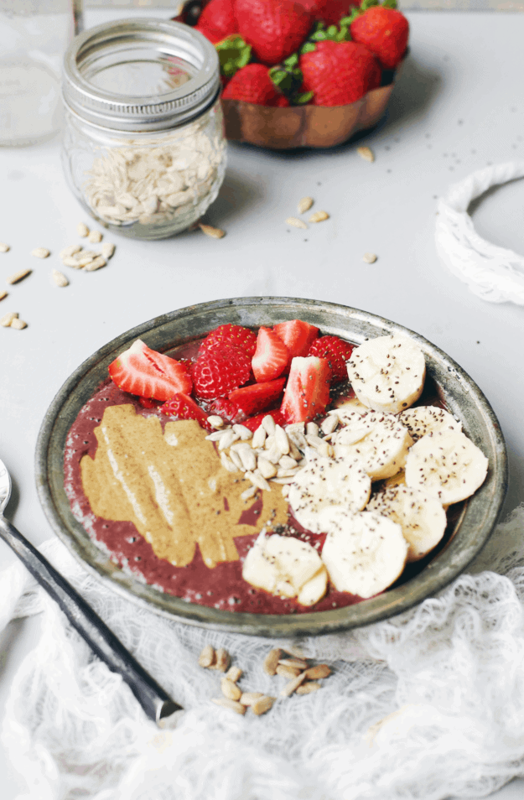 Grab the recipe for this incredible almond butter acai bowl below. Enjoy! Place the acai packet, frozen banana and coconut water in a blender, and puree until smooth. Pour in a bowl. Cut up fruit and place in the bowl on top of the acai. Pour in the almond butter and top off with nuts and seeds. Serve immediately and enjoy! When you say “pour almond butter”—is there something you do to it to make it thinner and creamier? Or is it a specific brand you buy? Because the almond butters I’ve always bought have been thicker in texture, more as a spread rather than a drizzle. Is this a stupid question? Haha! Where do you find your acai?? I haven’t been able to find it anywhere! Hey Michelle! I get the Sambazon acai packs from Costco! Love LOVE LOVE acai bowls! They are perfect for a post workout treat! Taste like dessert, but healthy! Love All the AB!